What happens when you have leftover pot roast, a chip craving, and a husband who loves Disney World? 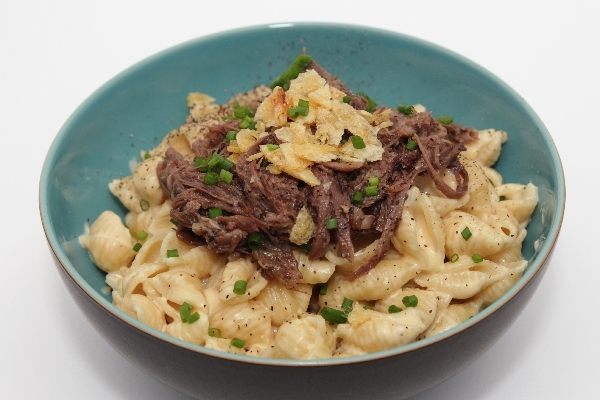 A Disney-inspired stovetop pot roast mac’n’cheese! The whole thing is a handful of ingredients and takes 30 minutes, tops. It’s got a super-easy sauce, healthy whole-grain pasta, and fabulous toppings. You can’t ask for much more than that. This delicious, easy comfort food was inspired by Disney World! There’s a little quick-service place in Magic Kingdom called The Friar’s Nook, and they have a crazy decadent Pot Roast Macaroni and Cheese. It’s hot, oozing with cheese, and topped with scrumptious soft pot roast. My version is a little less decadent, but I don’t think anything is missing. The sauce is dreamily easy–THREE ingredients, and no roux required! It’s also the perfect use for leftover pot roast. And of course, you can make it exactly to your liking. Not Spring-y enough? Try adding green peas and mushrooms. Not feeling cheddar? Swap in your favorite melty cheese! I’ve started to write recipes with the ingredients listed pre-prepped (like “8 ounces cheese, shredded”). My tendency is to just start cooking and then chop and prep the other ingredients together as I go, but honestly, I’m a very slow cook. I don’t even know how many chicken breasts have dried out in the pan while I scrambled to throw a sauce together. The classic French idea of mise en place — having everything out and ready to go before you start — just works better for me. If you are a fast prepper and can cook and chop at the same time, by all means do so. And maybe share your secrets with the class, pretty please? Recipe inspired by Disney World and adapted from Minnie Poppins. Boil a large pot of salted water and cook pasta. Remove pasta from heat just a little bit before it's done to your liking and drain. Set aside in the colander. Meanwhile, heat the pot roast in a large skillet. You can either warm it with its sauce, or you can crisp it up a bit and add a little sauce later. In the pasta pot, heat evaporated milk over medium low. Add cheese a handful at a time until it's all melted. Stir for 30 seconds or so until a smooth sauce forms. Remove from heat. Stir pasta into cheese sauce; sauce will continue to thicken slightly. Serve immediately, topped with warm pot roast, kettle chip crumble, and chives!